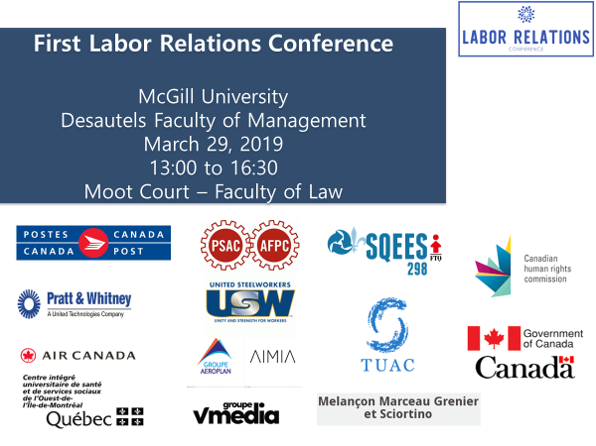 Featuring conversations between industry leaders about the experiences that shaped their organizations, this First Labour relations conference host by McGill Desautels Faculty of Management combine the power of personal narrative, best industry practices to deliver an impactful and innovative learning experience to students. Three roundtables, three labour relations discussion topics, 17 industry professionals coming from management, government/state institutions and unions. One networking opportunity to connect with these industry professionals. Hosted by Prof. Chantal Westgate & Tatiana Lamoureux Gauvin. No registration needed, open to the public.